You guys, this season of The Walking Dead has been giving me tons of feelings. With a major character that I love potentially dying but potentially being okay, this season has left me a hot mess of big fandom feels. It also doesn’t help that the showrunners are low-key trolling us all by taking the actor’s name out of the credits and making us wait WEEKS to find out this guy’s fate. 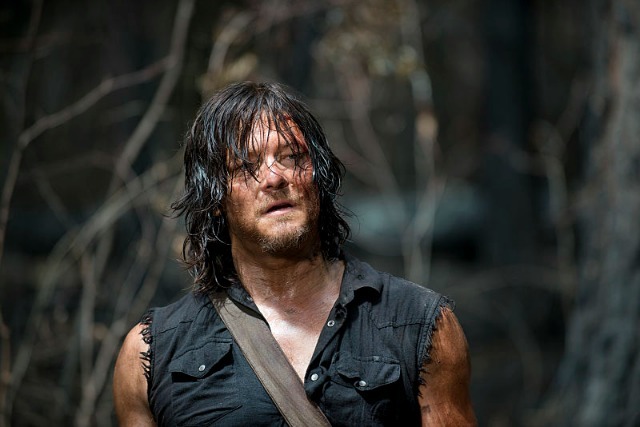 …Daryl is separated from Sasha and Abraham after a spontaneous attack. While my first instinct was to call the attackers Wolves, they seem far too in control and too calculated for the crazy, unrestrained brutality of the Wolves. They’re also attacking in cars with guns, when Wolves–at least the ones we’ve met–attack on foot without guns. I have a guess on who the attackers are, but more on that later. As Daryl is trying to hide from his attackers, a group of three road-weary travelers take Daryl captive and steal his crossbow. Right off the bat, it seems like these three think Daryl is someone he isn’t, repeatedly saying Daryl is “one of them”, defending the bag they’re carrying by saying, “we earn what we took.” It’s obvious that these guys have clearly escaped from someone, but again, their lucid nature and the lack of a grotesque W carved into their forehead makes me think they aren’t Wolves. Read the rest over at The Mary Sue, and tell me your thoughts on the episode in the comments! This would be the most random coupling in walking dead history if it plays out.. seems a bit forced to me if that’s the case. Hoping not. That said, great ep, on the edge of my seat for next week! Yeah the pairing is super random. If they really do make them an actual couple, I might be on board after I see them together a bit more. But right now it just seems like they’d both be unhealthy for one another–and you’re right. Super random pairing. I just really loved Sasha and Bob. They were perfect together.